Bram Berlin / Warm Up + Ade Alafia on drums. Located in Koreatown, The Spot is a hidden venue that allows you to get away from the big clubs and their politics and just dance. Bottles are cheaply priced and drinks are strong - be prepared to go until the break of dawn! CLICK HERE for Cheap Bottles! CLICK HERE for $10 Admission! Introduced to House Music for the first time in 1985, Oscar P is recognized as an innovator and force in New York City's music scene. His musical style fuses influences from NYC, Chicago and Detroit, creating a unique sound that can be heard on remixes for such artists as Soul Minority, Simone Moreno, Distant People, Foremost Poets, Black Fras, Todd Terry, Physics, and Marvin Gaye. 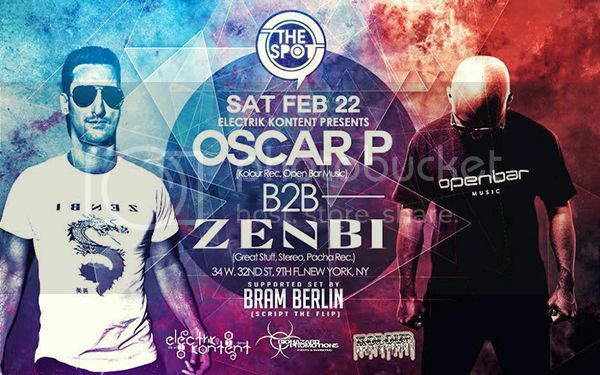 Oscar P goes B2B with a man who has consistently managed to have one of his tracks or a remix of one of his tracks reach Beatport’s Top 100 every single month in the past year. Zenbi has managed to take over Washington DC’s club scene with a residency and his own party at Lima, appearances at Flash, and on Feb. 7th he will play alongside Victor Calderone at one of DC and the United State’s hottest clubs, U Street Music Hall who has featured some of the biggest and best names in House & Techno Music in the world! Zenbi has managed to take over Washington DC’s club scene and is now coming after New York, America, and all over the globe! Don’t miss this party on Feb. 22nd featuring back to back bangers all night long and until the early morning! Address: 34 W. 32nd St, 9th FL.